The Gray-crowned Rosy-Finch is a medium-sized, dark brown finch of about 14 to 16 cm in length and 22 to 26 grams in weight; the Pribilof and Aleutian island forms are larger (17 to 21 cm in length and 42 to 60 grams in weight). Adults are rather stout with long wings and a notched tail. Adult male plumage includes pink on the wings, belly, and rump, a black forecrown and gray band around the hindcrown (in some races gray is also present on the cheeks, and the head appears mostly gray). The breast and flanks are brown, nasal tufts are white, and the bill is yellow in winter and black in the breeding season. The sexes are similar in size and appearance, although in females the black in the crown and the pink in the plumage are less distinct. Juveniles are similar in appearance to adult females but with overall duller coloration and lacking the gray crown, black forehead, and pink on the underparts (MacDougall-Shackleton et al. 2000). The Gray-crowned Rosy-Finch is most likely to be confused with other rosy-finch species. The Black Rosy-Finch is much darker bodied (blackish or blackish-brown) with less extensive pink on the underparts, and lacks the mostly gray head present in one race of Gray-crowned Rosy-Finch that winters in Montana. The Brown-capped Rosy-Finch lacks gray on the head, and the body plumage is a richer brown with darker and more extensive pink on the belly. Ranges of the three species rarely overlap during the breeding season (MacDougall-Shackleton et al. 2000). Breeding birds move up to mountain tops with fledged juveniles following breeding (Johnson 1965), then leave the alpine for the winter. 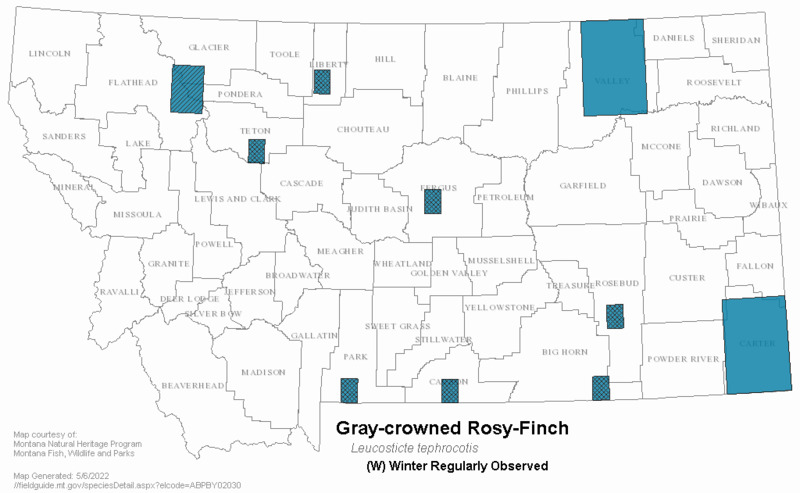 Movements between breeding and wintering grounds of Montana rosy-finches have not been documented, but some birds in winter flocks are the Hepburn's race (Leucosticte tephrocotis littoralis) that breeds in the Cascade Range and mountains of western British Columbia, Yukon Territory, and Alaska (Hendricks 1981, Swenson et al. 1988, MacDougall-Shackleton et al. 2000). 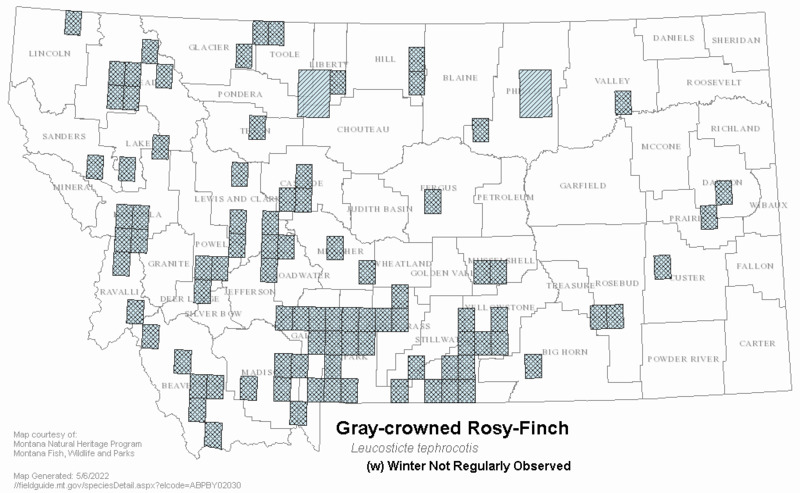 Local winter movements of at least 40 km (with a mountain barrier in between) have been documented in the Bozeman-Livingston area (Swenson et al. 1988). Breeding, nesting, and winter roosting habitat in Montana is similar to other regions in the species' range (Johnson 1965, Hendricks 1981). Gray-crowned Rosy-Finches nest in crevices in cliffs and talus among glaciers and snowfields above timberline (also in abandoned buildings above treeline) and forage in barren, rocky or grassy areas adjacent to the nesting sites; in migration and winter they also occur in open situations, fields, cultivated lands, brushy areas, and around human habitation. They may roost in mine shafts or similar protected sites. During some winters individuals move out onto the shortgrass and midgrass prairies to feed (Hendricks and Swenson 1983, Swenson et al. 1988). No food habit information is available for this species in Montana. 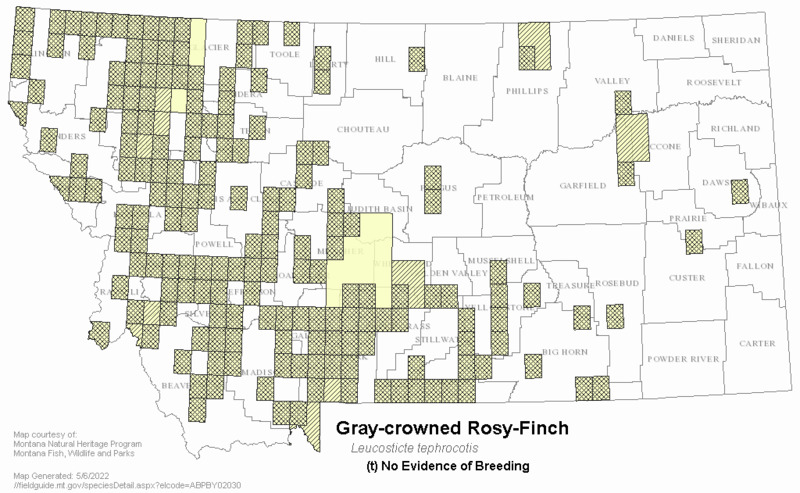 However, food habit studies completed on them in other areas of their range indicate Gray-crowned Rosy-Finches forage on the ground for seeds. In the spring and summer they glean wind-transported insects from the snow. They normally feed on snowfields and meadows, particularly at the edge of snow patches (Johnson 1965). Later in the season they glean insects from vegetation and catch flying insects, as well as continuing to feed on seeds. Winter foods include seeds taken from the ground, from stalks protruding through the snow, and at bird feeders (MacDougall-Shackleton et al. 2000). 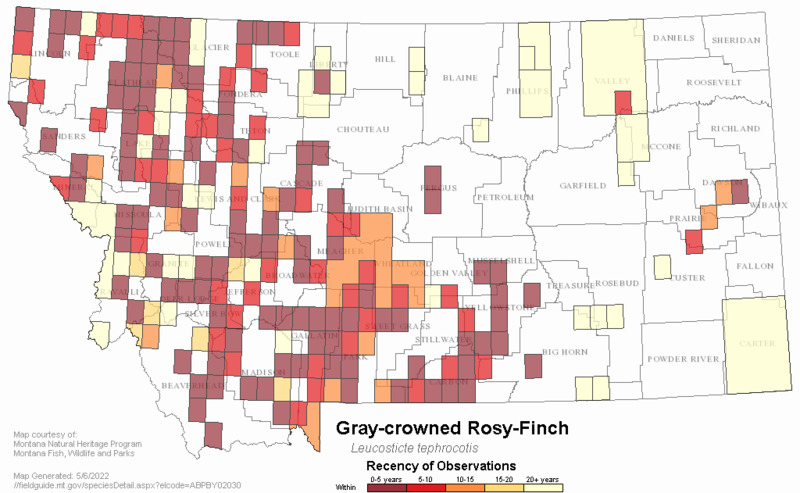 Ecological information for Gray-crowned Rosy-Finches is limited from Montana. Information available from other sources within the species' range states that males typically outnumber females in breeding and wintering populations. During the breeding season males defend a "territory" around the female wherever she moves (Ryser 1985, MacDougall-Shackleton et al. 2000). Gray-crowned Rosy-Finches are commonly found in large flocks (up to 1000+ individuals) when not breeding, sometimes in flocks composed of other rosy-finch species. Little information on reproductive habits is available. 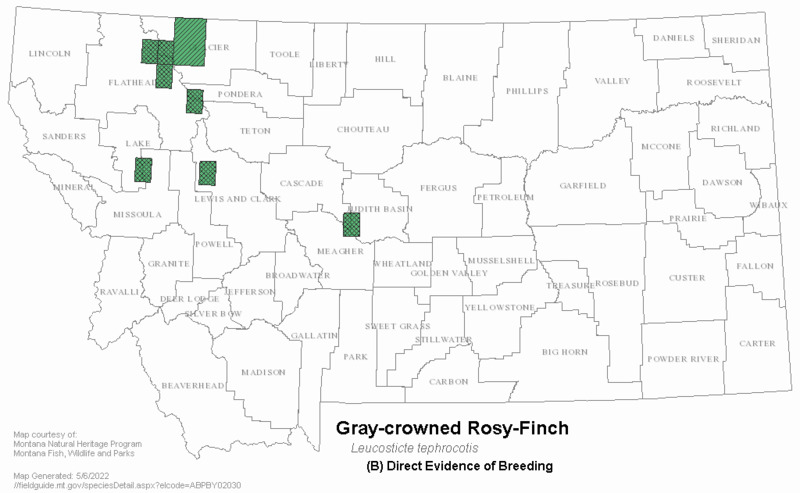 Clutch size of five Montana nests was 4 to 5 eggs, nest building occurred in mid-June, and young fledged in late July or early August (Johnson 1965). No special management action appears to be required at this time, although traditional winter roosts in abandoned mine shafts should be protected and reclaimed using methods that allow continued access by the birds, if possible. Hendricks, P. 1981. 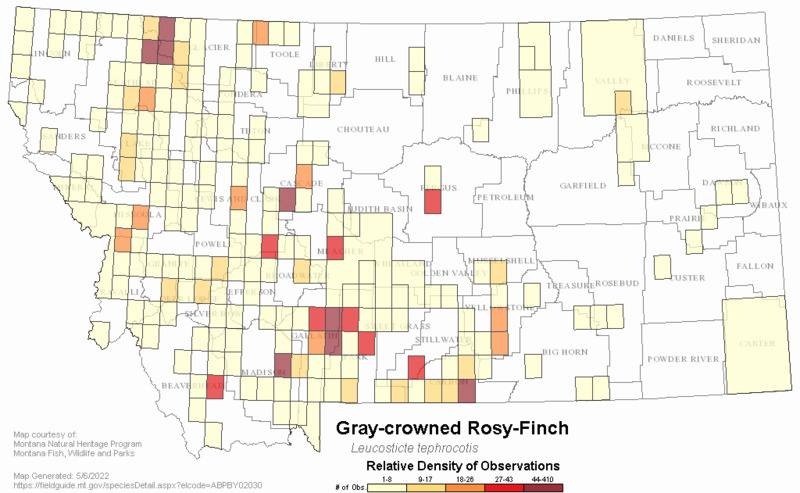 Observations on a winter roost of rosy finches in Montana. Journal of Field Ornithology 52:235-236. Johnson, R. E. 1965. 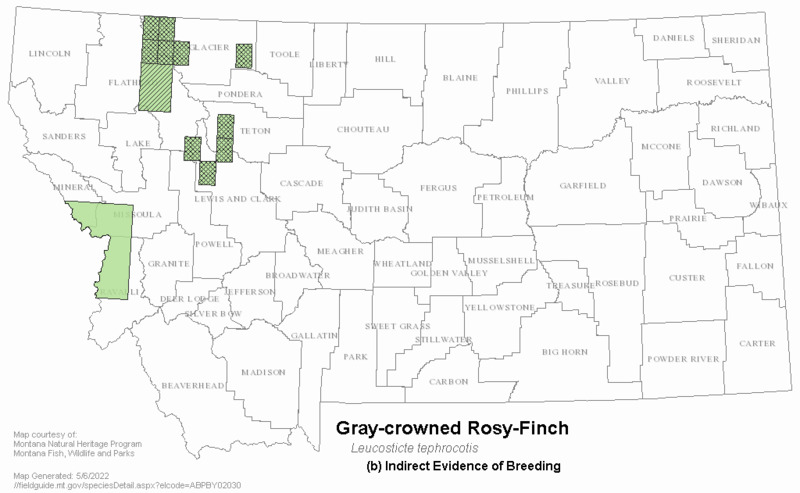 Reproductive activities of rosy finches, with special reference to Montana. Auk 82:190-205. Hoffmann, R. S. 1960. Summer birds of the Little Belt Mountains, Montana. Occasional Papers of Montana State University No. 1, Missoula. Wheeler, R. 1940. Nesting habits of the leucosticte. Condor 42:133-139. 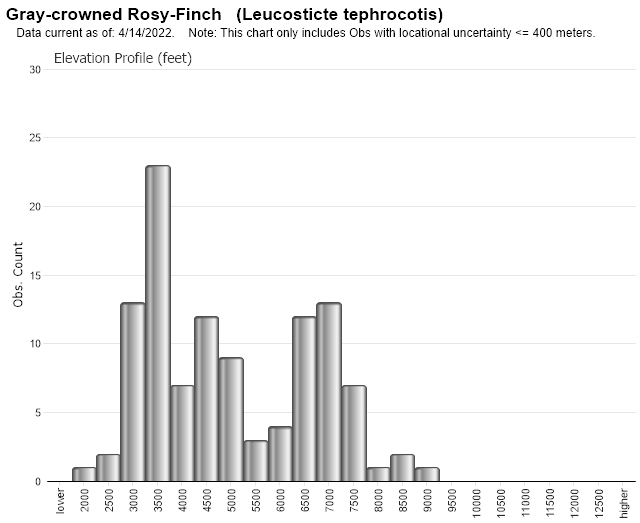 Web Search Engines for Articles on "Gray-crowned Rosy-Finch"